Last week, US Senator and presidential candidate Elizabeth Warren tried to end the controversy that has dogged her for claiming—truthfully—that she has Native American ancestors. She called Bill John Baker, principal chief of the Cherokee Nation, and apologized for taking a DNA test to support her claim. Critics say Warren’s claim, initially based on family lore, infringed the prerogative of Native American tribes to determine their own membership. It also smacked of a clumsy attempt—unsuccessful by all accounts—to gain employment advantage from affirmative action. The controversy delights President Donald Trump, who continually taunts Warren with the racist nickname, Pocahontas. Warren understandably wanted to lay it to rest before formally launching her presidential bid. Unfortunately, her apology wasn’t abject enough for Washington Post political reporter Annie Linsky, who described her reaction on the Post Reports podcast. Because for me, I have followed this for so long and it just didn’t make sense to me that she would just apologize for DNA tests and not the underlying, sort of, original sin. Original sin. 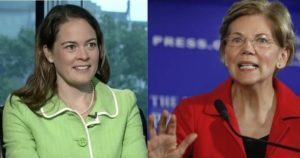 In her interview with Warren, excerpts of which were played on the podcast, Linsky grilled the Senator, enumerating the various things she thought Warren should apologize for. “OK,” the reporter concluded with a nervous laugh. She was giving a more robust, more details about this private conversation and this private apology that she made to the Cherokee. So I guess she has now, for the first time, apologized for all of it. Well, that’s a relief. The ritualized, forced apology has now been acted out with enough granularity to satisfy the Washington political reporter who took responsibility for adjudicating its sufficiency. Linsky seems deaf to the character of coerced apologies, and the overbearing demeanor of inquisitors who extract them. It smacks of a ritual loyalty oath. A brief check turned up no case where this Washington political reporter has pursued President Trump’s persistent use of a racist taunt to deride Warren. Nor are we inquiring into the wisdom of Warren’s proposal for wealth taxes on the super-rich, or her focus on income inequality and lax rules for financial corporations. We aren’t even talking about Republican efforts to suppress Native American voters. Instead we’re consumed\ with whether Warren’s apology for offending Cherokee sensibilities was sufficiently detailed. Enforcers of political correctness are always hardest on their ideological bedfellows.